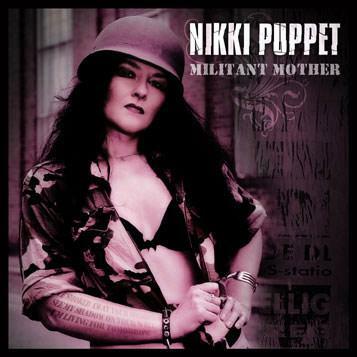 Nikki Puppet - "Militant Mother"
Out of the Rock and Metal stronghold of Hannover arises a band that sets their standards through charismatic vocals, polished, authenticated songwriting, razorsharp solos and heavy riffs. NIKKI PUPPET were formed in autumn 2003 by Nicky Gronewold and Christos Mamalitsidis, Nicky is basically the name generator of the band. Since autumn 2004 is the present line up with bass player Anke Sobek and Florentin Adolf on the drums complete. Now, following their highly praised debut album „Puppet on a string“, arrives their second album „Militant Mother“ and as with „Puppet on a string“ was produced in the ARENA 20 Recording-Studio, Hannover by non other than Herman Frank, long time producer and successful guitarist with bands such as Victory and Accept. The new album „Militant Mother“ entices with 11 crisp, stick in the head compositions, where the bridge has been skilfully built between traditional Heavy Rock and modern Metal. Their musical repertoire ranges from up-tempo numbers such as the opener „Lost in Time“ or „Open up your mind“ to Heavy Rock songs such as „Militant Mother“, the rocking punk styled „Paralized“ through to the balladic „Turning in Circles“ or the rockin’ steam engine version of Billy Joel´s legendary song „We didn´t start the fire“, that still today is topically relevant. Through the productive, symbiotic partnership between producer Herman Frank and NIKKI PUPPET the band’s own individual style has been able to develop and is now shown to the fullest.